There are a lot of sounds and noises around us. 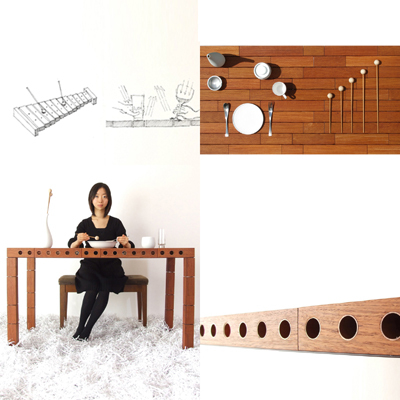 This tabel has a mechanism like a marimba. When you put objects on various points of it, you have hear various sounds. For example, you hear a high tone when you knock a short wooden bar and you hear a low tone when you knock a long wooden bar. Having dinner on this table will be transformed into a marimba playing experience.